Franktown in a Blaze of Excitement. $85,000 Buried By a Highwayman — Efforts to Find the Sack of Money — What the Spirits Say About the Matter — History of the Search. I had been a highway robber on the plains for years and had accumulated eighty-five thousand dollars. I started back to California to take a steamer for the East. In November I reached Washoe valley, and seeing that a storm was brewing, I feared that I could not cross the mountains to California, so concluded to bury my money. 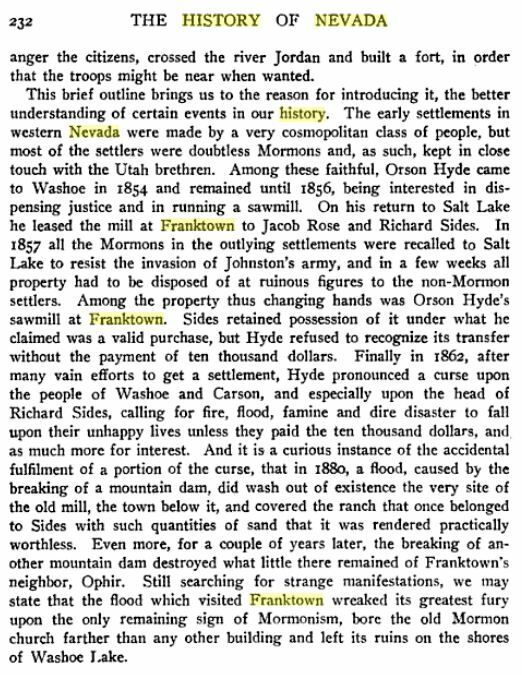 I therefore buried it, back of Franktown, above what is known as the old Mormon mill, with the intention of returning for it in the spring. Not being satisfied with my gains, I went on the road again. Now here I stand, convicted of murder and doomed to die. EARLY SEARCH FOR THE GOLD. The above story is as told to me by a man who heard it, and who came to Washoe valley on purpose to seek the buried treasure. He came in 1858 or ‘9 and was well known to your correspondent and to all the old settlers in the valley. Failing in his search, he left in disgust for parts unknown. For years nothing has been openly said about the treasure, although it has been searched for from time to time by several parties. THE AID OF SPIRITS INVOKED. It has been known here for several days taht a prominent spiritualist from California, not at all acquainted with this section of the country, has described the exact location of the Morgan mill, and that he has led many up the side of the mountain to look after a fortune. Your correspondent has had an interview with Mrs. Bowers, “the Washoe Seeress,” and she says there is treasure hidden somewhere near Franktown. As she was here in ’54, she remembers well the story about the treasure. But strange to say, when she calls on her spirit friends, none of them are able to tell her the exact locality of the deposit. Even her deceased husband and brother, whom she claims to be her constant companions, say they know nothing about it. The spiritual Mr. Bowers tells her that if he did, he would be sure to tell her, as he knows she needs money. Maurice May had an idea that he knew where the treasure was hidden. So about 5 o’clock last Sunday morning, he and a confidential friend started out with pick and shovel to become suddenly rich. They at last reached the proper place to dig when, lo and behold, there they found a hole about four feet deep, and all that remained of the treasure was a dollar and a half, lying on the ground near the hole, an evidence that some one had been before them in the search. On the way home Maurice looked so disappointed to think that some of our Franktown Christians had robbed him of Eighty-Four Thousand, Nine Hundred and Ninety-Eight Dollars and fifty cents that a favorite dog failed to recognize him. The dog bit him and May shot the animal. It is hinted around that May suspects Judge Harcourt and Constable Frank Wooten of robbing him of the treasure that was as good as his, so that a double duel may soon be expected. Charles F. Wooten Takes Poison at Victoria. Please give me a decent burial. I am a member and P.M. of Washoe City, Nev., U.S.A., and send your bill to my lodge. You will please inform James Twaddle, Tulare City, Tulare county, Cal., of this, and instruct him to tell my wife. I ask her forgiveness. No one to blame but myself. This is a cold world. Good-bye, Josie, good-bye. May God bless you and protect you. I have disgraced you, that is all. Frank. Known in Victoria as Whittaker. Good-bye, my love; good-bye. FRANK. 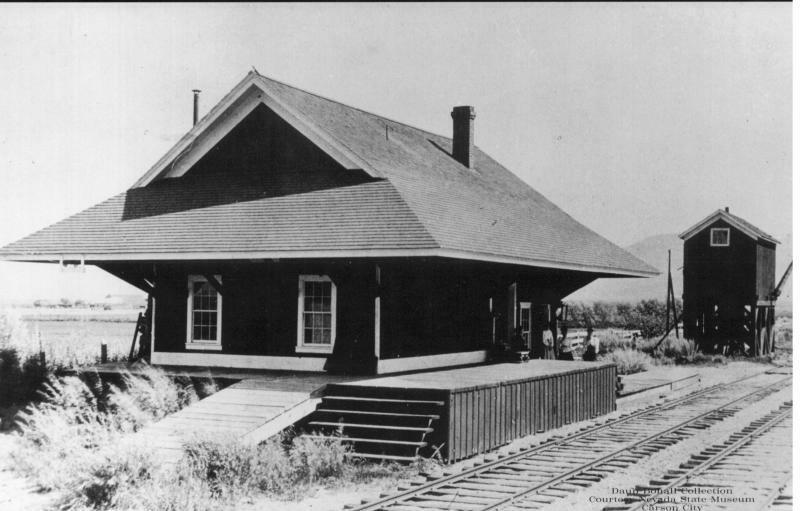 The article mentions both Mormon Mill and Morgan Mill. I am not sure if this whole thing is made up (correspondent’s name is Chuck-A-Luck, after all) or if one of the mill names is a typo, as there appears to have been both a Mormon mill and a Morgan mill, although Morgan Mill was in Empire, Nevada, which is about 90 miles a way, give or take a few, so I am inclined to think he means Mormon Mill, which according to the page below, was owned by Orson Hyde, a Mormon. The Mormon mill was a sawmill, while the Morgan mill processed ore. If I were to bury a fortune, I wouldn’t do it near a mill where they process ore, for fear some of the miners or other workers might find it.